Grom-Atar is now in my radar! Frustrations sometimes lead to great inventions and this is exactly what happened to Zach who created Grom Social, Social Networking for the Youth. Zach Marks is a twelve year old American who came up with an idea and be part of a popular social networking group that caters to kids his age and a lot younger – Grom Social. 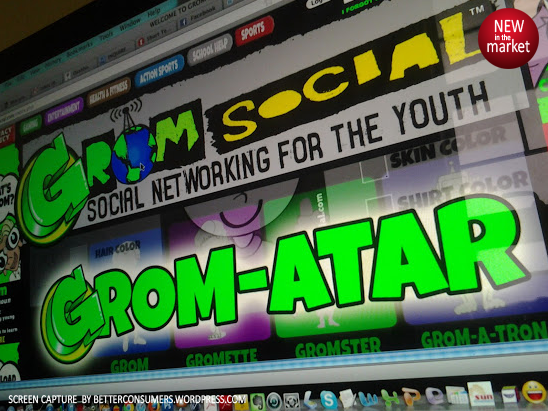 At a very ‘tender age’ Zach created Grom Social (reportedly with his parents) is a social network for kids (the youth!) in America and Canada whose ages range between, say, 5 – 16 years old – learned enough to understand the web! It has 7,000 members now and 6,000 individuals actively using the site. Joining the social network is tough because a screening process is required to allow a child or a parent become part of it. How? Someone who is in the network should vouch for you as part of the screening process. This allows the admin of the networking group to approve your membership and be part of this network. The strictness of the process is a must knowing child predators, stalkers, and/or bullies can ruin the very purpose why GROM exists. GROM, according to the website, is a noun and it describes a promising young individual, who is quick to learn. The term is a slang that actually means a young surfer or wakeboarder but I guess Zach liked the “surfer” term because kids his age are quick to learn and therefore are promising – makes sense! Grom Social boasts of a battery of safeguards and filters that will ensure that peer pressure is eliminated and parents are informed via email of their child’s activities once on the social network. The network can also detect curse words and these things will not even get the chance to be posted on the site. Grom is a very promising social networking site (with FAQs for parents who have more questions!) but with all the activities that goes on in this age of “fourth screen” (They are the television, computer, smartphone, and tablets), I sure hope that kids can still find the value of hugging, kissing their parents, do horse play and bruise their knees running around playing tag and still enjoy oneself messing around with their siblings. Growing active and mature is still what kids need in this nano age where love and experience is taught and learned from parents. Social Networking is healthy to a degree in improving relationship but not when you get to talk to people face to face. Social Networking, New in the Market believes, is not an end to the means. I hope we understand the difference. It was promising to note that they are doing to have, “everyone to enjoy Grom Social. All over the world! !” So watch out, Philippines! Previous PostLucky Me Tries to be Salt-FreeNext PostSM, Puregold: Big is Beautiful? Thank you. It’ll be good to hear from Grom how the developments are with your social network.